The product has been added to shopping basket. Your order will be produced when all technical and commercial details are clear. In more specific terms: printing files are correct and checked by our graphics department and payment has been cleared as well (Paypal, credit card, positive invoice audit or cash in advance with transfer voucher has been sent to us). If there's a delay due to wrong or missing files or missing payment, the date of delivery may be delayed as well. If you need your order delivered due to a certain date, please let us know when ordering so we can take extra care of your desidered delivery date and change your order if needed. When your order is cleared in all details till 4pm, the production will start on the next workday (monday till friday). 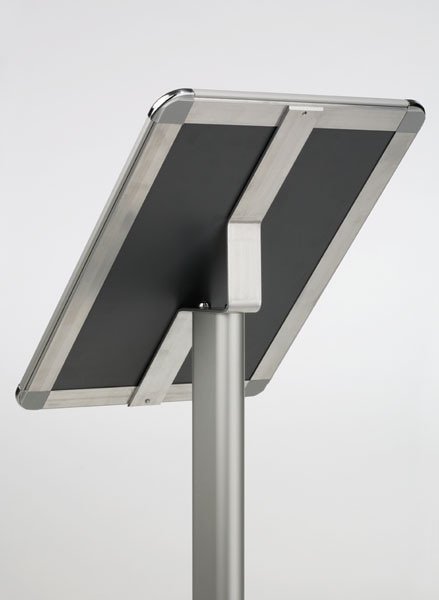 The Info Presenter Classic A4 size is an eye-catching information display 800 mm high for a high impact presentation of information at entrance areas and foyers. It is composed of a silver coloured base plate, an aluminium standpipe and a snap frame (25 mm wide aluminium profiles) with rounded corners. 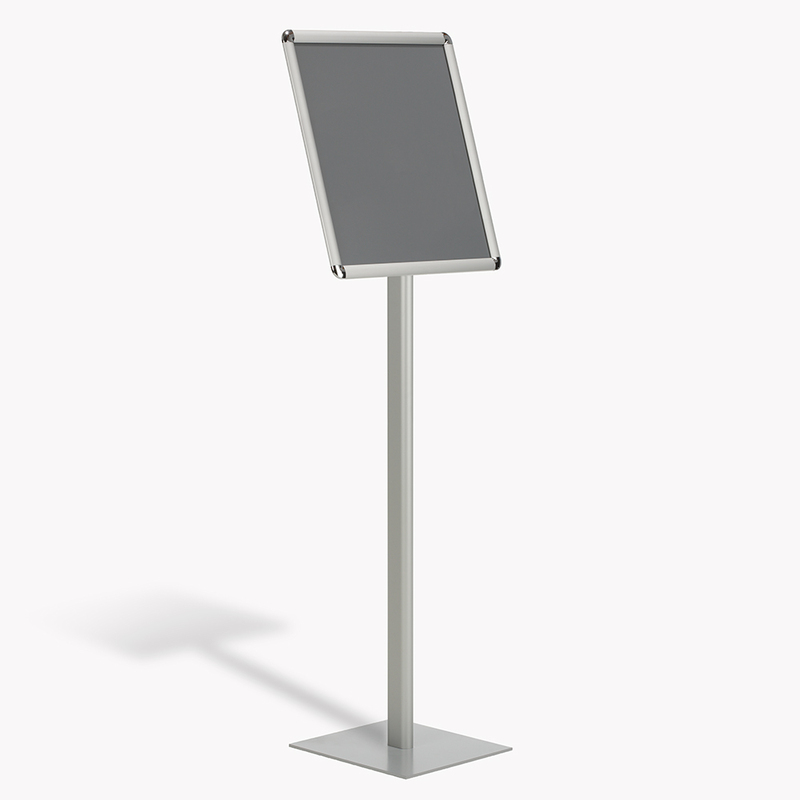 The Info Presenter Classic A4 size (210x297mm) is an eye-catching poster stand 800mm high for the presentation of advertising and information at entrance areas and foyers. 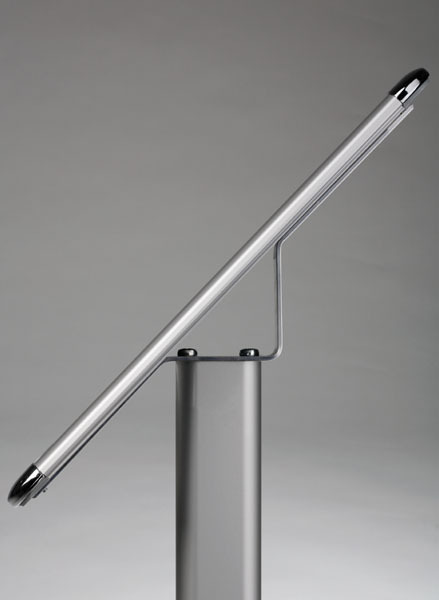 It is composed of a silver coloured base plate, an aluminium standpipe and a snap frame in portrait format (25mm wide aluminium profiles) with rounded corners. The snap profiles facilitate an easy and quick poster exchange due to the tried and tested snap technology. Information and motif protection is secured by an UV-stabilised anti glare front sheets and an impact-resistant backing panel. Text, photos, graphical elements and videos are protected by law. Reproduction without our permission is not allowed. Pictures can deviate from the original product. Sales to business people, legal person under public law or special funds under public in the sense defined by §310 Paragraph 1 BGB German Civil Code. All prices in Euro, 19% VAT will be added.